With some great stylised and retro animation, Batman Brave and the Bold Volume 1 has our favourite masked detective team up with some of the DC Universe’s most known and unknown characters. For the uninitiated, the DC Universe is a collection of all their superheroes from Superman to Green Lantern and stranger characters such as the Blue Beetle. The series is based on some of the current characters in DC Comics and is all about action, adventure and a healthy dose of comedy. Batman is the main character in the series (aka Bruce Wayne) who in each episode teams up with a variety of different characters to take on some dangerous threat or super villain. Although each episode has main team-up character, there is always a conclusion of another Batman adventure before it and best of all, it features another DC Universe character. Later on in the series, you’ll see Dr. Fate and even the Green Lantern Corps. The first episode “Rise of the Blue Beetle!” has Batman teaming up with a new superhero known as Blue Beetle and together they embark on an interstellar adventure. It’s great seeing Blue Beetle look up to Batman and of course learn the ropes from this veteran superhero. My favourite episode in Volume 1 however, is “Evil Under the Sea!” that has our masked adventurer teaming up with the extremely cocky and gun ho King of Atlantis, Aquaman. With a threat on the King’s life, Batman and Aquaman must use their vast resources to undercover this nefarious crime and to make matters worse, it’s all under the sea. Other episodes include Plastic Man and the Red Tornado and although these first four episodes were still trying to find their feet in this series, the episodes get better and better as the series progress. 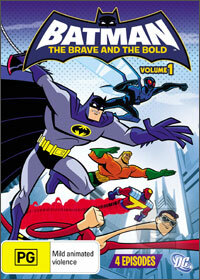 Match with the stylised animation that portrays some great visuals, Batman the Brave and the Bold Volume 1 is a series that can be enjoyed by children and adults alike. Children will gaze in wonder seeing these new superheroes, while adults will reminisce down memory lane.